Engineering using state of the art Solid Works 3D Solid Models, to ensure a perfect fit and smooth integration of the feed system with your equipment. 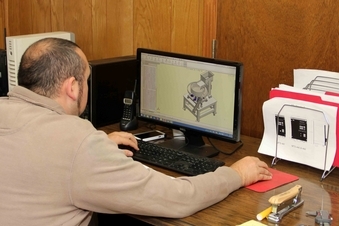 Complete design and build services, from simple tables and plates, to complete systems including pick and place units to accurately place the parts where you need them, with or without controls. Complete fabrication of feeder bowls, tables, air tracks, vibratory inline tracks, conveyors, hoppers, and controls. We build new systems from the ground up, or in many cases we can re-work and re-configure your existing system to feed a different part. Contact us for an evaluation of your existing system. We will also do in your plant evaluations of your existing equipment to help you with feed and efficiency issues. 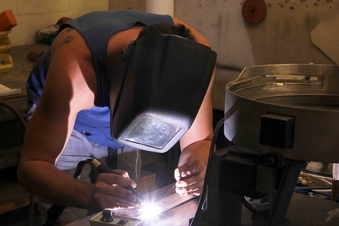 We service any manufacturer's equipment to keep you running smoothly, and to minimize your down time. Please remember, our goal is to keep you satisfied and your equipment producing product for you!